Bank stabilization may involve the construction of a retaining structure that should not only effect the natural filtration between the watercourse and the bank, but also guarantee the required consolidation. ​and the high structural resistance. The presence of sub-grades and banks, that are normally saturated or which have unpredictable erosion phenomena, make the application of flexible structures a necessity. They must be able to withstand differential settlement without losing their structural integrity. ​​Bank stabilization may involve the construction of a retaining structure that should not only effect the natural filtration between the watercourse and the bank, but also guarantee the required consolidation. Furthermore, the presence of sub-grades and banks, that are normally saturated or which have unpredictable erosion phenomena, make the application of flexible structures a necessity. They must be able to withstand differential settlement without losing their structural integrity. Gabion structures are the ideal solution on account of their flexibility, natural drainage capacity due to the stone filling, and the high structural resistance. We offer a Free design services for your structure. 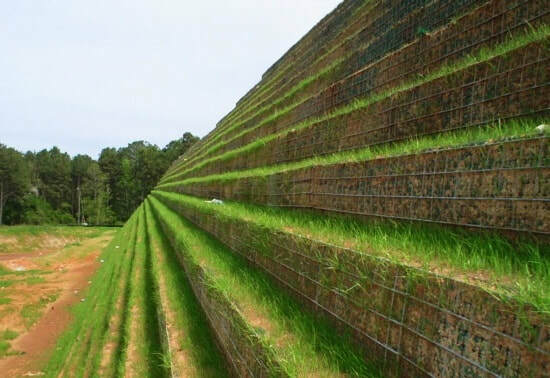 ​Green Gabions are modular gabion units used for stream-bank stabilization, restoration and erosion protection solutions. They are specifically designed for use with soil bio-engineering techniques including live-staking, brush layering and rooted plants in creating permanent, vegetative, armour systems. ​These gabions consist of a basket manufactured from heavy galvanized and polymer coated double twisted hexagonal woven steel wire mesh which is lined with a 100% coir blanket. The unit is filled in-place with gabion stone; the voids between the stones are filled with quality topsoil, before the unit is closed. The topsoil sustains the establishment of the vegetative soil bio-engineering techniques while the stone fill provides a rugged system skeleton. Light bank protection with geosynthetic MAC-MAT technology & Natural Combines for environmental restoration.